Ekiti State University, EKSU important notice to fresh students as regards hostel accommodation. Authorities of the Ekiti State University (EKSU) wish to inform the parents and guardians of the newly admitted 100 level Students that the University has made provision for limited Bed Spaces for 100 level students at the new Adekunle Ajasin Hostel of the University and the Hostel at our Ifaki campus for the pre-degree students. Arising from the above, all interested 100 level and pre-degree students, are expected to meet the following criteria before they can benefit from the allocation of the Bed spaces in the Adekunle Ajasin Hostel and the Ifaki Campus Hostel. Collection of Hostel allocation form at the Directorate of Students Affairs. Showing evidence of the payment of the Acceptance fee. Showing evidence of the payment of the school fees in Full/Receipt of payment should be attached to the Hostel Allocation form. Submission of the Hostel Allocation form to the Directorate of Students Affairs on or before 12th October, 2015. Participate in Bed Space balloting which will come up on 14th October, 2015 at the Directorate of Students Affairs. Payment of a sum of N20,000.00 only for the bed space allocated at Ajasin Hostel and N25,000.00 for the bed space at Ifaki Hostel and showing evidence of payment on or before 16th October, 2015. Failure to pay for a bed space allocated to any student in these Hostels on or before 16th October, 2015 will automatically lead to a re-allocation of the bed space to another willing student who is ready for immediate payment. Medical students in clinical year will enjoy automatic Bed space allocation at the Medical Hostel at the Ekiti State University Teaching Hospital upon the collection of the Bed space allocation form and showing the evidence of the payment of school fees and the payment of the prescribe Hostel Accommodation fee. Directorate of Students Affairs will not be liable for the failure of any student from getting a bed space in the Adekunle Ajasin and Ifaki Hostel. 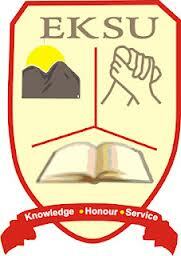 For further enquiries contact the Directorate of Students Affairs Ekiti State University, Ado-Ekiti.